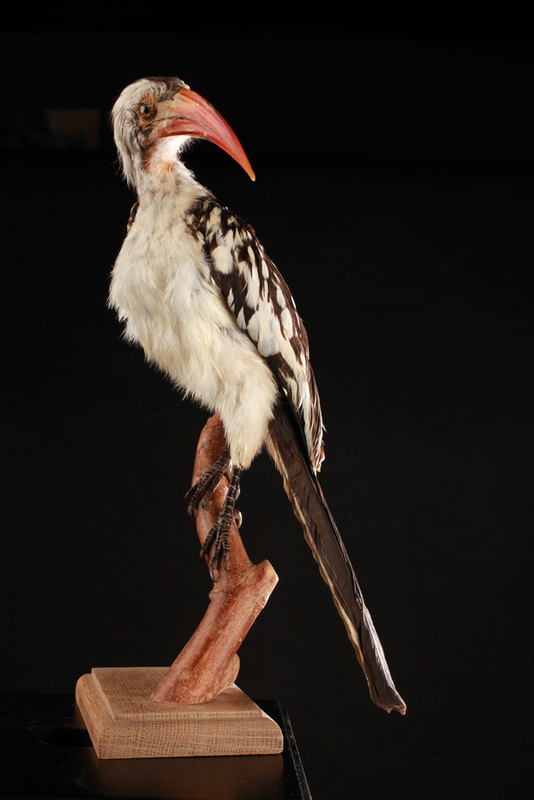 This little black and white hornbill is distinguished mainly by its spotted wings, white outer tail feathers and long curved red beak. 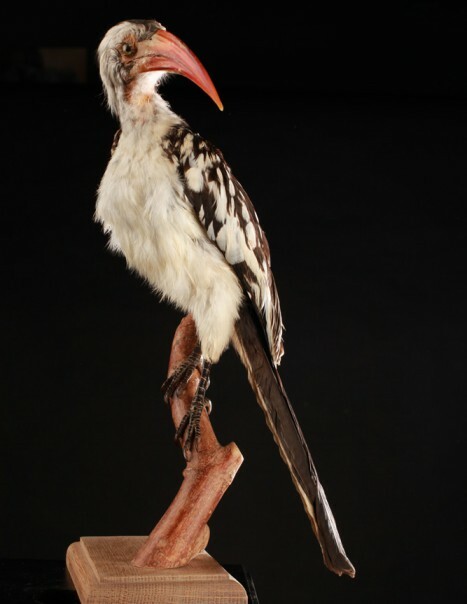 The male displays a small yellow spot at the base of the beak, unlike most other species of hornbills and its beak is not overcome by a helmet. The bare skin around the eye and that covers the throat varies from pink to yellow. The eyes are brown. The female is smaller than its partner, the black spot that adorns its lower mandible is reduced. Juveniles resemble the adult male, but their beak is shorter and light orange. Life expectancy is estimated at 18 years. They frequent open savannas and woodlands, dry and thorny scrub. They are from Africa and the Sahara. They evolve from Senegal to the Horn of Africa in Tanzania, Angola, Namibia, Ethiopia and Mozambic. There are officially 5 subspecies. Laying occurs 4 to7 weeks after the start of the rainy season. It takes place from March to November in West Africa, for many months in the North East and East Africa, from April to May in Somalia, from February to March in Namibia and from September to February in the central and southern the continent. They couple defend their territory and their nest is placed in the cavity of a tree above the ground. They also use old nests that they adorn of green leaves or a few pieces of bark and dry grass. The male is responsible for site selection and assists his partner by bringing the materials that will be used to seal the entrance. Laying includes 2 to 7 eggs that are deposited within 1 to 7 days. Incubation lasts 23 to 25 days and begins with the filing of the first egg. The female and youngs are fed by the male. 16 and 24 days after hatching, the mother breaks the wall that holds the prisoners and emerges at the entrance with older chicks. The final flight is performed only after 39 to 50 days. 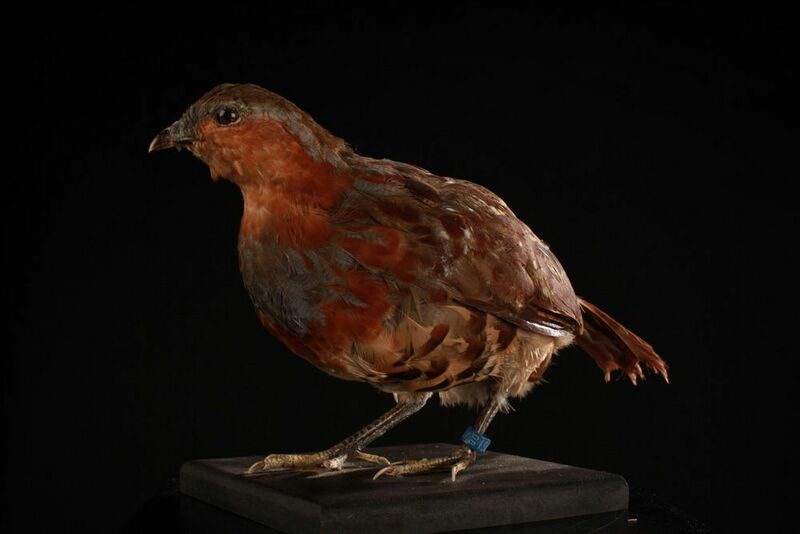 The female takes advantage of her stay in the cavity to achieve the moulting of her feathers and her tail feathers. Beetles, termites, grasshoppers, fly, larvae, invertebrates constituting the bulk of the diet. Small skeleton animals like geckos, chicks and rodents do not constitute less valuable prey. Some fruits are also ingested and during the dry season, the birds of the nominate race seem to like the seeds.